Aptech Limited is an international, career education company with presence in more than 40 countries. Aptech assists the Government of India in offering fully-sponsored education to students from all over the world. The Indian Technical & Economic Cooperation (ITEC) program is a fully-funded program run by the Government of India with the goal of encouraging cooperation & partnership among developing countries, for mutual benefit. Under ITEC & its corollary SCAAP (Special Commonwealth African Assistance Programme), 161 countries in Asia, East Europe (including the former USSR), Central Asia, Africa, Latin America, the Caribbean, and Pacific & Small Island countries are invited to share the Indian developmental experience in various fields. As a result of different activities under this program, there is now a visible and growing awareness among other countries about the competence of India as a provider of technical know-how and expertise as well as training opportunities, consultancy services and feasibility studies. If you wish to join a program sponsored by the Government of India, fill the application form online. For more details on ITEC/SCAAP, please download the brochure. Aptech offers 5 ITEC/ SCAAP courses at regular intervals. Each course will be conducted in New Delhi, India, over a span of 8 weeks. Check the 2018-19 course calendar. 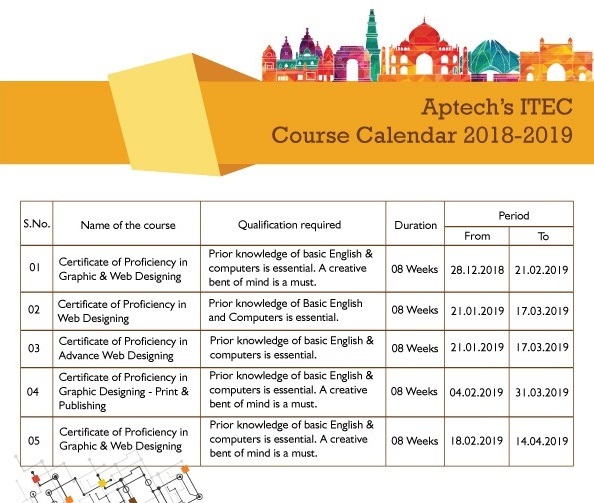 In 2018-2019, Aptech offers 5 ITEC/ SCAAP courses at regular intervals. Each course will be conducted in New Delhi, India, over a span of 8 weeks. Wish to come to India & study under the ITEC/ SCAAP program? Fill the application form online to get started. Where is Aptech's ITEC/SCAAP program conducted? Aptech has chosen India's capital city, Delhi, as the venue for the ITEC/SCAAP program. This is because Delhi is a multicultural, multilingual city that has a lot to offer to its visitors. From good food and a fun night-life to extraordinary sightseeing opportunities, Delhi has it all. The city is home to hundreds of resorts, restaurants and cafes that serve all sorts of world cuisine. An ancient, living city, Delhi is thousands of years old. This rich history has left its mark on the city, with historic forts, temples, mosques and other monuments that draw tourists from around the globe. What's amazing is that all of this culture and heritage exists alongside ultra-modern, world-class shopping malls, clubs, and other amenities. No matter where you come from, Delhi is sure to have something for you too. Submit the completely-filled nomination form to your nearest Indian Embassy or High Commission. The Indian Embassy/ High Commission will then forward the form to the Technical Cooperation Division of the Ministry of External Affairs, Government of India, who will send it to Aptech for acceptance. On approval by the Ministry of External Affairs, New Delhi, the Indian Embassy/ High Commission will arrange for your travel to-and-fro at the expense of the Government of India. Students of Aptech shares their ITEC/ SCAAP experience. Watch the videos! Apply for ITEC/SCAAP program now! Have your education in India sponsored by the Government of India. For details, please download the brochure. "The course was enriching, and the country incredible. The institute has a conducive environment for foreigners. The people at Aptech are very experienced and capable. Everything done by GOI & the institute was simply the best!" "For me, participating in this course has been the most interesting & amazing experience of my life. I had the good fortune of meeting the best trainers. They are well prepared, intelligent, knowledgeable & immensely helpful. I admire them for their capacity to deal with people from different countries, cultures & diverse thinking. Thanks Aptech, thanks India for this wonderful opportunity. I"ve learnt so much in this incredible country, which I shall transmit to my friends." "I want to thank the Government of India & Aptech for this wonderful opportunity. After attending the English & IT course, I am all ready to prove my skills in these areas. This training was a great experience for me to learn something new from a different country and perspective. I benefitted so much from my stay in India." "The course is of great help in my work. It trained me to represent my country in many international bodies and on global platforms, which are related to my work. As far as my stay in India is concerned, I can"t find words that can express my deep respect, love and appreciation for this great country, Aptech and all the kind people." "For me as a teacher, the Aptech course was very useful. I improved my English, and this is just the beginning. I want to continue learning & build upon the knowledge I gained from here. Thanks a lot!" "No words to describe. Only thanks for this marvellous, didactic, informative, interesting & fruitful 70 days!" "The idea of bringing people from different nations and training them on a fully-paid scholarship deserves a huge thank you. The course is interesting and result-oriented, as was witnessed from the positive changes in the participants." "The graphic & web designing course is very engaging, informative & valuable. The teacher explains everything very clearly & patiently. The stay in Delhi was absolutely marvellous. I fell in love with the warmth, culture, colorfulness & food. Thank you!" "Everything was perfect, starting from the pick up at the airport, the hotel arrangements to the training. The course is informative, and the trainer did a great job. She is a very kind person. The coordinators are helpful. I wish I could come for a second time!" "The course is really effective; the lectures are clear & easy to follow. I love Aptech! Thanks for giving me an opportunity to study here. I hope I will be able to apply everything I learnt here in my job." "The graphic & web designing course is very vital. It has enlightened me on issues I was not even aware of. In fact, it has assisted me to go beyond what I have been doing in my day to day work." "I would like to thank Aptech, especially my teacher for making the training so effective & efficient. The course is very useful for us." "The courses at Aptech are useful, effective & wonderful. A big thanks to Aptech - you helped us reach towards our goals. I met people from different nations. I"ll never forget this course & my two months in India." "The English & graphic designing course was very good & helpful for me. Our teachers were excellent; they showed us the way to having better skills. The lessons were remarkable and we also got time to explore the culture & landscape of India." "The course helped me to broaden my knowledge, and learn more about graphic designing. Thank you Aptech for selecting me to participate in the course. I"ve gained valuable experience and feel privileged." "The course was an eye opener. I was very impressed by the standard of professionalism shown by the Aptech management, faculty, and everyone else. It was such a lovely environment. Your hospitality cuts above the rest." "This course has been very interesting & helpful. It gave me confidence to speak in public. The stay in India was incredible & very exciting." "I enjoyed the English & business communication course from the very beginning. The training was excellent. It helped improve my reading, listening, and especially my speaking skills. I learnt a lot of new things that I didn"t know before attending this course. I thoroughly enjoyed my stay in India and even started liking Indian food." "I liked my course because of the way it"s organised. It also helped me improve my written & verbal communication skills. The training methodology used by the trainer helped us to be confident & bold. My stay in India was fantastic." "The English & web designing course is very informative & effective. It"s given me a lot of knowledge that will be useful at my workplace. The lessons taught in the class were audible, clear & very interesting. The trainers & staff at Aptech are friendly & helpful. It felt like being at home." "The course at Aptech is of a high standard. The classes are carried out with different theoretical & practical techniques, which help students to learn easily & efficiently. The teaching methodology is excellent." "I am extremely impressed with the whole programme & the opportunity granted to the participants to better themselves in English & IT. The performance of the management & staff at Aptech is an added motivation, and a boost to the students. We are grateful for that." "The course was very effective & practical. I am sure that the knowledge & skills acquired here will help all the participants in their work. The facilities were very good, everything was well organised, and of a very high level, which made the course not only effective but enjoyable." "From the beginning of this course, I could experience an improvement in my English. I could communicate easily with my classmates, who came from different countries, and also write better. Further, the web designing course helped me tremendously. I"d like to thank the sponsors - Ministry of External Affairs, India and Aptech." "The web designing course is very relevant to my job, and so is English. The trainers are well prepared & patient, and helped me understand the courses." "My experience with Aptech, and the course, was very good. I appreciate the staff for being friendly & helpful. I am really grateful for the amazing hospitality. India is incredibly beautiful. I spent some unforgettable moments here." "The graphic & web designing course was very effective & useful. Despite it being my first attempt at learning these programs, the trainer made everything easy to understand. I am totally satisfied with the course & enjoyed staying in India. I loved the sightseeing trips & simply adored shopping at these places. I"ll never forget the times I spent with my super great & funny international friends." "My trip to India was my first to a foreign land, and I was absolutely amazed. There were so many things to learn, not only in the class but outside as well. Aptech"s training programmes opened my eyes to new possibilities. Thanks to Aptech for all the new skills I acquired in English & IT." "I learnt from two very competent trainers, who have the capability to deliver information to students in a simple & clear manner, and also observe the students" attention & compatibility with the course. The entire ITEC team is an expert at dealing with everyone. I loved India; it"s a wonderful, beautiful & charming country." "Everything was perfect! I learnt about many diverse cultures from participants who came from different countries. I loved my trainer & am very proud of her. All people at Aptech were friendly, polite & helpful. I will never forget India or Aptech." "It was a marvellous experience! The course was very useful & interesting; a great opportunity to practice & reinforce my skills, as well as fluency. India is a country full of surprises & teachings. It has certainly broadened my perception of life & living. This opportunity has enhanced my skills at a personal, professional & spiritual level." "I am short of words, because it was more than my expectations; a great experience that cannot be forgotten. From the outset, our faculty was very patient. My stay in India brought about a tremendous change to my way of thinking & reasoning, with different people from different backgrounds & cultures. I call it a superb lifetime experience. God bless Aptech, the Indian government & my great country Nigeria." "The quality of lecturers has had an immense impact and made the web design & development course more interesting. I enjoyed both, the course & my stay in India. I am now a better programmer. Thank you." "Amazing experience! Every second, India astonished me. The course was excellent; I had great teachers & wonderful classmates. I found many opportunities here. I came here to learn PHP, but I ended up improving my English & made many good friends. I will keep in my heart all these things. This course will change many things in my life. Thanks for the opportunity." "Very efficient course. We really studied hard, and were kept interested & focussed. I appreciate it. My stay in India was a beautiful adventure. I developed much as a person. I was a total beginner in web design & development, but gathered a lot of skills in just 14 weeks." "Though I had some background in web design & development, I learnt many more new things. The instructors are so good & full of knowledge that they answered every question. I always woke up expecting new things, and indeed I got many." "I really enjoyed my stay because it gave me an opportunity to interact with 31 other individuals from different countries & enabled us to share professional as well as personal experiences. The course is well designed, and organised in such a way that it allows us to get an understanding of concepts of web design & development in an advanced manner." "I found the advanced web design & development course to be very informative & educative. I learnt many things in terms of design & implementation of web graphics & animation. These new techniques will certainly help improve my skills as a web designer. The hospitality shown in India was great & I do hope to come again." "The advanced web design & development course increased my wealth of knowledge, and was a mind opener to the world of information technology. Our teachers made the course easy & enjoyable. I enjoyed my stay in India as well. It was an awesome lifetime experience in incredible India." "My course & stay in India were very memorable & interesting. I learnt a lot, and also got an opportunity to visit several places. It felt as if I was in my own country. My lecturers & head of the school were so helpful & caring, that I never felt that I am from another country. I thank everyone at Aptech for giving me this opportunity."